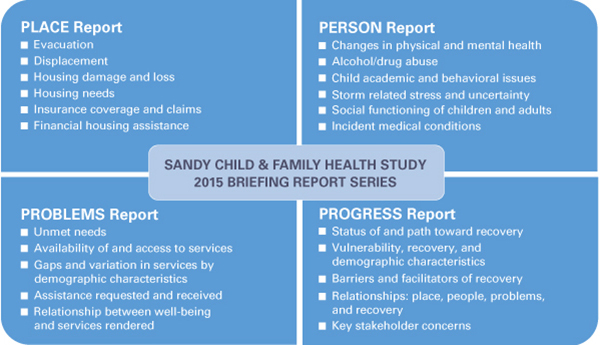 The Sandy Child and Family Health Study (S-CAFH) is comprehensive study exploring the population impact of Hurricane Sandy on residents of New Jersey. 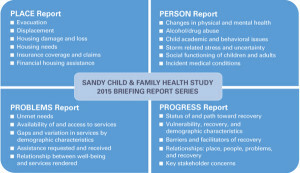 Having been modeled upon the longitudinal Gulf Coast Child and Family Health Study (G-CAFH), this study will add to a unique body of disaster recovery research in the United States. S-CAFH is a multi-center partnership of academic researchers from the Rutgers University School of Social Work, New York University’s Global Institute of Public Health, Columbia University’s National Center for Disaster Preparedness, and Colorado State University’s Center for Disaster Risk and Analysis. The study has been carried out in consultation with a New Jersey Public Partnership Group composed of officials from the NJ Department of Health, the NJ Department of Children and Families, and the NJ Department of Human Services. A team of nearly three dozen dedicated interviewers and staff, led by the Rutgers University Institute for Families at the School of Social Work, conducted baseline interviews between August 2014 and May 2015. Community-based interviewers completed 1,000 face-to-face surveys with randomly selected adult members of households in the 9 most affected counties in New Jersey. 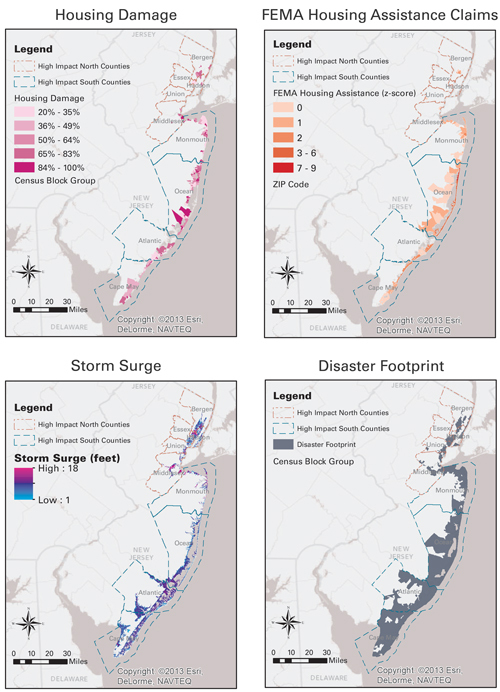 The survey instrument covered topics such as the decisions households made related to both evacuation and to recovery issues, their health and well-being during and after Sandy, and the assistance they sought or received. In addition to learning about the adult or adults in the household, the team also asked specific questions about children living in the same household. To be eligible to complete a survey, selected residents had to be the primary household resident at the time of the storm and 18 years of age or older. The first wave of surveys covered topics such as the decisions households made regarding evacuation and recovery issues, their health and well being, and the help they have sought or received. Additionally, specific questions were asked regarding children in the house in an effort to identify long-term impacts of the storm on children and youth. 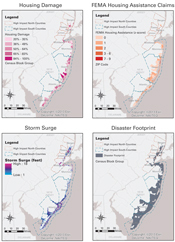 A “Disaster Footprint” was constructed by identifying areas that experienced a storm surge of at least one foot, areas where a significant number of homes sustained damage, and areas where many people requested FEMA assistance. Since the geographical area inside the Disaster Footprint contained approximately one-eighth of the state’s population, a smaller subset of this population was randomly selected to participate in the survey. The data collected from the 1,000 survey participants represents the views and behaviors of the 1,047,000 persons who live inside the Disaster Footprint. The Progress Report – explores the factors that stalled or facilitated recovery among affected residents.